Soul sensation" (Asbury Park Press), Remember Jones received Asbury Park Music Award's Top Vocalist in 2016. The captivating "showman" (The Star Ledger) and his powerful backup band returns to the Axelrod with a brand new concert that promises to tear the walls down. 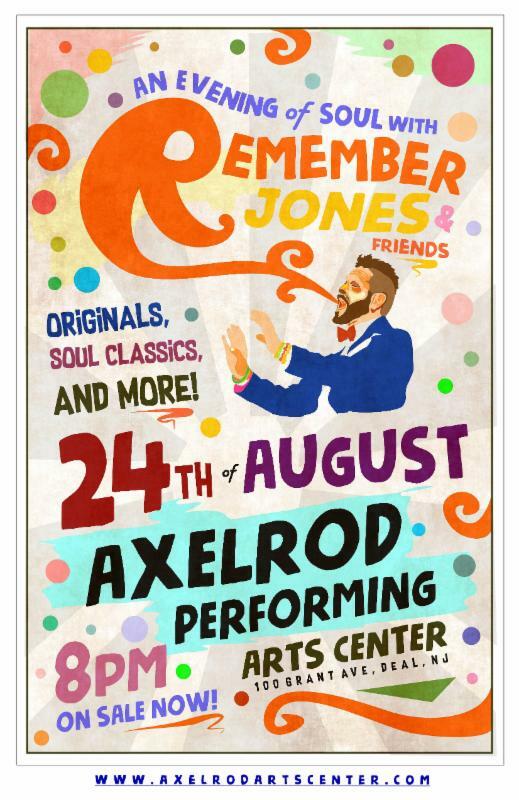 Remember Jones's electric personality and powerful, soulful voice harken back to the great rock and roll legends of times gone by, and his tributes to such pop luminaries as Joe Cocker, Amy Winehouse and Jeff Buckley have played to sold-out houses around the Northeast. Giuseppe Verdi’s operatic masterpiece La Traviata, based on Alexandre Dumas fil’s popular play La Dame aux Camélias, has remained one of the most popular operas of the standard repertory—both before and after Richard Gere took Julia Roberts to the opera in Pretty Woman (another story about a streetwalker with a heart of gold)! In Hollywood, La Traviata was famously filmed by the great Italian director Franco Zeffirelli with a starry cast led by Placido Domingo as Alfredo and Teresa Stratas as Violet. 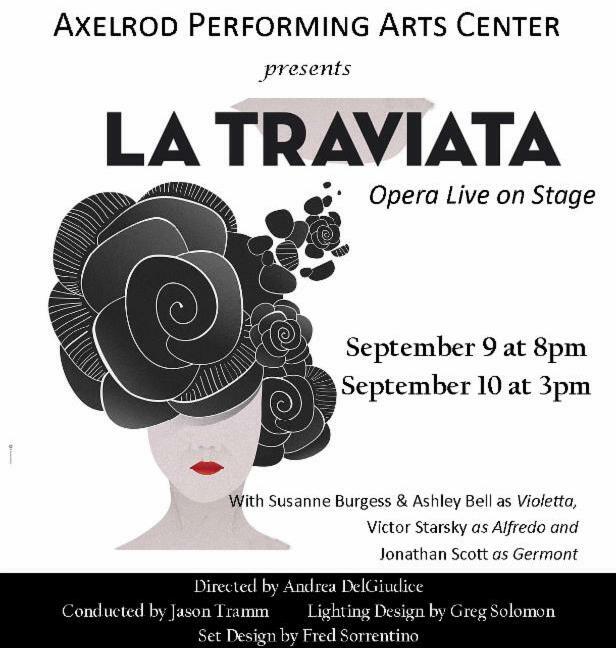 Fully costumed and staged, La Traviata will be directed by Andrea DelGiudice with a live orchestra conducted by Jason Tramm, starring Susanne Burgess and Ashley Bell as Violetta, Victor Starsky as Alfredo and Jonathan Scott as Germont. Lighting design by Greg Solomon and set design by Fred Sorrentino. The Axelrod PAC presents the world premiere production of The Next Big Thing with book and lyrics by J. Laurence Lowenstein and music by Gerald H. Bailey. When up-and-coming young actor Scott Morland sets his sights on climbing to the top of the Hollywood heap, there’s virtually nothing and no one who can stop him. What sacrifice is too great to make it in the movie biz? Will he give up his true love, his family, his best friend to become “The Next Big Thing”? Nominated as a finalist in the 2015 Eugene O’Neil New Musicals, The Next Big Thing is receiving its premiere at the Axelrod PAC with a professional cast led by David Owen Naughton, with direction and choreography of Gary John La Rosa and musical direction and orchestrations by Thomas Conroy. The cast also includes Christine Aziz, Sarah Chapin and Kyle Huey, Matthew Krob, Jon McHatton and Mark Poppleton. The Concert of a Lifetime, Celebrating the Life & Legacy of Dr. Herbert R. Axelrod, the founding donor of the Axelrod Performing Arts Center and a leading philanthropist in the worlds of classical music and the sciences, features one of the world’s most celebrated violinist Joshua Bell along with violinists Pamela Frank and Daniel Heifetz, pianist Julia Zilberquit, cellist Peter Wiley and other guest as well as the Smithsonian Axelrod Quartet playing on the Golden Age stringed instruments that the Axelrods donated to the Smithsonian Institution. Funds raised at this concert go toward the Herbert R. Axelrod Legacy Endowment Fund to support future programming at the theater. Kelli O’Hara has unequivocally established herself as one of Broadway’s great leading ladies. Her portrayal of Anna Leonowens in Lincoln Center's critically acclaimed revival of The King and I garnered her a 2016 Tony Award for Best Leading Actress in a Musical, along with Drama League and Outer Critics nominations. The Jason Robert Brown musical The Bridges of Madison County earned her Tony, Drama Desk, Drama League, and Outer Critics Circle nominations. Additionally, she starred as Mrs. Darling in NBC’s live telecast of Peter Pan alongside Allison Williams and Christian Borle, and on New Year’s Eve 2015, Kelli made her Metropolitan Opera debut in the production of The Merry Widow with Renee Fleming. She made her Broadway debut in Jekyll & Hyde and followed it with Sondheim’s Follies, Sweet Smell of Success opposite John Lithgow, and Dracula. Kelli starred in The Light in the Piazza on Broadway in 2005 earning her first Tony and Drama Desk Award nominations. She joined Harry Connick on Broadway in the 2006 Tony award-winning production of The Pajama Game, for which she received Tony, Drama Desk, and Outer Critics Award nominations. Kelli starred in the Tony Award-winning revival of South Pacific at Lincoln Center, enrapturing audiences and critics alike with her soulful and complex interpretation of Nellie Forbush, and garnering Tony, Drama Desk, and Outer Critics Award nominations. She later teamed up with Matthew Broderick in Broadway's musical comedy Nice Work if You Can Get it, earning Tony, Drama Desk, Drama League and Outer Critics Circle nominations, as well as the Fred Astaire Nomination for dance.